Located right next to Shinjuku station is Gotran Cherrier, arguably the best bakery in all of Tokyo. The bakery is named after the famed Pastry Chef and entrepreneur Gontran Cherrier. They serve up some mean French pastries and coffee alike! There's also some Japenese cultural influence in their menu in Japan. Indeed, the matcha line-up is to die for! The matcha choux cream is particularly amazing and there's heaps of other items to choose from too! One thing to mention is that their croissant is totally on point. Look at those flaky layers! Dominque Ansel Bakery offers something a little more chic! Located on Omotesando, and a few minutes walk from Omotesando station, this place is hugely popular with tourists and local Japanese women! You can pretty much order anything here and not be disappointed, but if we had to suggest one thing, it would be the Cronut, which is one of French-born pastry chef Dominique Ansel's original creation that is described as a cross between a croissant and a donut. Don't forget to bring your phone though, everything is super photogenic with plenty of snaps on Instagram at the moment. Two other unique items here are the Frozen S'more and the Cookie Shot! Say Whaaaattttt! I'm just salivating writing about this! This is classic-style Japanese Bakery with a French twist. With a few locations around Tokyo. The Shibakoen store offers a bit more of a walk-in-the-park kinda feel with a warm atmosphere and an interior to make you wanna sit down enjoy a coffee and a pastry. Located just a short 5-minute walk north of Shibakoen station on the Toei Mita line. Le Pain Quotidien has a stellar array of bread and desserts. Definitely reminds you of European-style artisan bakeries. They also so solid brunch-style meals that could be Tokyo's best European-style breakfast. Time to make plans this weekend for Sunday Brunch with you friends. Le Pain wants to promote a place where people can gather and get away from the hectic demands of daily life, and just breathe and enjoy "traditional simplicity". Their breads are a combination of organic flour and simple ingredients, artisanal savoir-faire, and stone-lined hearths. What a delight to the senses! The City Bakery has quite a steady following, already gaining popularity with foreign visitors and locals. Located inside Shinagawa Atre, just next to Shinagawa station, it's very busy with travellers and workers in the mornings and evenings trying to get a bite to eat or takeout. There's an abundance of breads with cheese and other toppings which are favourites among the mix. Their chocolate swirl brioche is definitely one of the top picks! And if you're wondering what the above is... head down there and ask for the hot chocolate and discover for yourself! Centre The Bakery is located in between Tokyo and Yurakucho station, about a 4-minute walk from Ginza Ichichome station on the Yurakucho line. Very, very popular with locals and tourists, you'll see plenty of people lining up on the weekends to get a seat inside. They have an interesting array of dishes and pastries, mostly eaten as a sit-down fare. You'd be hard-pressed to find a fruit sandwich overseas, but here it's one of their most order items. Fresh cream and fruit and soft bread - YUM! One thing I really like about this place (one of the main reasons people come here) is the fresh bread tasting set. You literally get a toaster at your table and toast your bread yourself. It comes with a selection of jams and spreads that compliment the delicious bread. 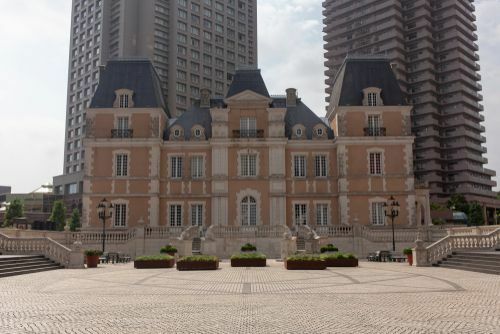 On your next visit to Ebisu Garden Place (pictured above), you'd better make this one a required stop! Joel Robuchon is 3 Michelin star French chef that has a one of its famous Tokyo address there called La Boutique De Joel Robuchon. The Boutique is a deluxe bread, cake and sandwich shop. You absolutely cannot go wrong with their simple croissant, but if you've worked up and appetite, their camembert cheese and ham sandwich should be your choice! Oh, and for those with a sweet tooth, this bakery doubles as a high-end patisserie too. The cake selection is a feast for the senses. What's unbelievable is that for an establishment owned by a chef of Robuchon's stature, the prices are very reasonable! The vast majority of the pastries, breads, and sandwiches are between ¥300 and ¥1,000.